Perhaps it was just me, but since I started with WOFF/OFF I usually fly German or British. I rarely fly American or French. But with my most recent career, I thought I'd explore the French experience. I'm glad that I did. and once a Fokker. But no credits. I did take down a few balloons. And after that I started carrying rockets all the time and if I didn't see anything, I'd go balloon hunting. (I fly with a house rule that I won't request a transfer unless I've accumulated five kills, been promoted, or received a medal.) So I started killing gas bags, to earn my five. Nevertheless, I learned something flying the 10 C1 that has helped me in the game. Since it's hard to bring down an Aviatik with a Lewis and a small load of ammo, I started working with my flight mates to kill these beasts. I learned to attack simultaneously with other friendlies. Hey, if the gunner is firing at your buddy, he can't also fire at you. And, gradually, I started getting credit for a few kills. This was a lesson that has stood me in good stead in 1916 when I started to run across Rolands. You usually outnumber them, so I take my time, work them down to the hard deck, and then go in with a buddy. Eventually, I moved to Verdun, and then Flanders with N65. I received a new Bebe, and then a 16, and finally a 17 Vickers, which is what I'm flying now on 1 October 1916. I've flown 180 sorties and have 49 kills. And why not? during my entire year at the front, I've held a maneuver and/or/speed advantage over German scouts. During the Fokker Scourge, I was downing Eindeckers in my 10 C1, 11, 16, or 17. Nor do the new Halberstadts, Fokker biplanes, or even Albatros DIs and DIIs outclass the Nieuport 17. I'm faster than anything until I see an Albatros DV, later in 1917. By then, of course, I'll be in a even faster Spad VII. For all the focus on the Fokker Scourge, in WOFFworld at least, we should be talking about a "Nieuport Scourge." The French rule the skies! It's taken me a while to get out of the habit of not throttling up when I peel over into a dive. (Nowi, you're not driving a Focke-Wulf!) But I've learned to love my Nieuport 17. No wonder Ball didn't want to give his up. So, if you're just getting started and you're looking to start a career with the potential of longevity, FLY FRENCH! The "Fokker Scourge" effects on the French was lower than on the British. Its main consequence was that daylight "strategic" bombings were stopped and replaced by night bombings. Against multiseats, the Fokker vs French Caudron / Farman kill ratio was around 1.5 vs 1, in favour of the Fokker (of course). A good english written source is the Osprey Dual Nieuport 11 vs Fokker EIII book. The Caudron G4 could fly higher than the Fokker E series WHEN THE ENGINES WORKED PROPERLY. (= not that often). Unfortunatly, it was also used as a "fighter" to protect Voisin bombers, and results were as bad as it could be predicted. The French had more troubles when german two-seaters with a good rear field of fire appeared, that's how Pegoud was killed as the main tactics was a dive from rear and shooting at short range. I’ve read the duel books on the Nieuport and the SPAD. It did seem to me that perceptions of Entente shortcomings in the air war (Scourge + Bloody April) have been skewed by the British perspective. Hell, I was downing Eindeckers six months before DH2s reached the front to “end” the Fokker Scourge! I received my N17 in the late summer of 1916. I’m having no problem handling Alb DI and Alb DIIs. I suspect the D III won’t be all that much better. And the named aces in N65 already are flying SPAD VIIs! Mine is on the way from the factory, or so I’m told. Yes, basically, the French Air Force had completly different problem from the British. Typically, in April 1917, the French lost 46 pilots, against 41 German pilots on the French Front, in May, 34 against 48. Those two months correspond to very heavy activity on the french front following the Nivelle offensive. The main failure actually came from the low production and/or low quality of multiseats planes between mid 1916 and end 1917. As an indication, French crewmen came on the front after a training of 80 hours + a training of 20 hours on the plane type they were to fly. In March / April 1917, squadron officers complained when the young pilots did not have those 20 hours "on the type", but they always had 80 hours training. But this also implied, logically, some losses during training. This rule was very strictly applied as front units clearly said they did not want young pilots to be a "burden" for more experienced pilots. Is there a one volume history of the air from the French perspective that you’d recommend? In French. My French is rusty but I think I could handle it. ah, well, if you're only looking for books in French then I can't help you! I actually had some recommendations... but they're all in English! however, I bet you could find a French (or English) version of Jean Beraud Villars' "Notes from a Lost Pilot". it was about a Frenchman who flew two-seaters and scouts throughout the war.. I was just thinking about digging it out of the library to read while my Caudron G.IV is an auto-pilot towards the front lines! he wasn't an ace. he flew obsolete two-seaters for most of his career. if you want high-flying adventure it might not be the best. but for a down-and-dirty-this-is-what-MOST-French-pilots-experienced... I thought it was pretty good. granted, it's been well over 10 years since I've read it! shooting the front delves into Allied recon practices. one of my favorite WWI book purchases ever! pre-ordered it for something like $80. so it honestly hurts a bit to see that the price came down so much in reprints! the Martel book on bombing might be cheaper in French reprints.... the English version is always around $50 to $60 dollars. that's what I've got. hope it helps. Stimulating posts gents'. And yes indeed even the 150hp Spad VII was fast, in the mid-190s kph, faster than the early Fokker D.VII (180hp). The most mass-produced Fokk. D.VII (OAW variant and others), with the "au" Mercedes engine, had a top speed about the same as the 150hp Spad VII, and likely a better climb rate too (thick airfoil). The Spad VII (180hp) is of course faster, similar in top speed to the BMW Fokk. D.VII (about 210 kph). If you prefer a real pocket-rocket, I recommend the rare 220hp Spad VII - only thing better than that is the 235hp Spad XIII with two-guns. Speaking of the Nieup. 17, the stock xfm looks about right - top speed of about 177 kph, decent climb rate, should be a good crate against early Alby. types, as Nowi has indicated. The earlier Nieups. are a bit too fast perhaps...will look into dialing the top speeds back on the Nieu. 16 into the mid-160s kph, the Bebe into the mid-150s or so, and the Nieu. 10 should be around the high 140s kph (about the same top speed as the DH.2, possibly a bit better). 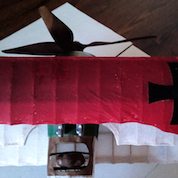 Will also tinker with increasing the wing loading further on the Nieu. 16 but this will have to wait for a future FM update pack once I find free time. The goal of the FM exercise will be to fit the early/mid Nieups. into the spectrum of already tweaked aircraft, and also as good opposition to the Alby. D.III and V/Va types that I also want to look into. in the book "Sharks among Minnows" there are a number of anecdotes that show that a courageously and skillfully flown two-seater was more than a match for those earlier Fokkers. I can't remember who the three parties involved were... but there was one story about a single BE2c being attacked by a pair of Fokkers and managing to come home in one piece. the fight went from several thousand feet all the way down to tree-top level. the Fokkers, I believe, thought they got him, but the British pilot skipped down behind some tree lines and got away. 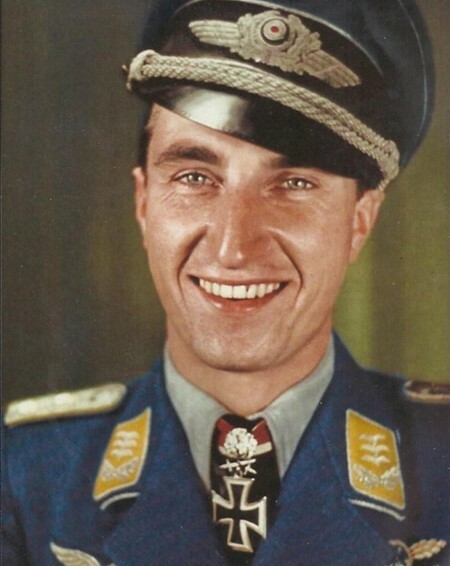 the observer apparently threw up inside of his cockpit because the flying was so violent and outrageous. still, throwing up in your cockpit has certainly got to be better than getting killed or taken prisoner! Yes, basically, all the difficulties we have in hunting two-seaters are somewhat realistic. 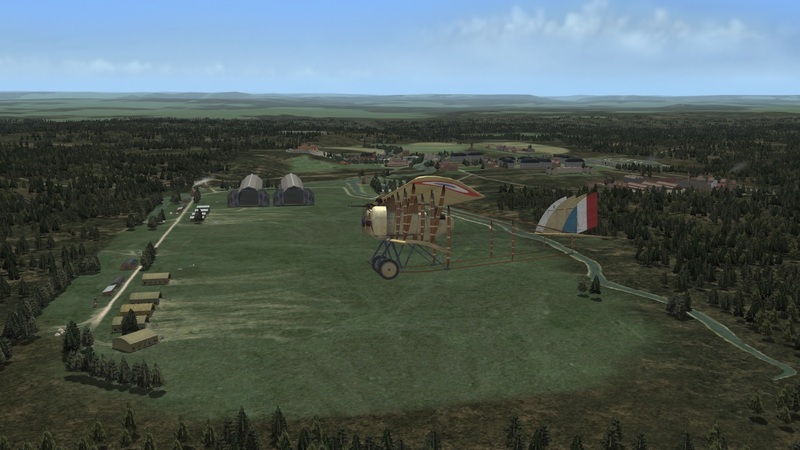 Nowi, try "French Aviation During the First World War" by Vital Ferry. It came out a few years back and is available in both its original French and English translation. Three RFC Brass Hats were strolling down a street in London. Two walked into a bar, the third one ducked. Former Cold War Warrior, USAF Security Service 1974-1978, E-4, Morse Systems Intercept, England, Europe, and points above. Lucky me, i just nabbed a copy of the book I mentioned above for $35.00 on eBay, and I had an unused gift card the kids gave me on Father's Day that covered it. Score! Giving the French a try. Sous Lieutenant Cyrano le Compte. Esc 49, Sept. 20, 1915. I have one word for you, young man. Balloons! And don’t try to tackle Aviatiks on your own. Let your buddies go in first. I find that the Caudron G.IV is quite capable of taking down multiple Aviatik C-types. the Caudron carries about four-to-six times as much ammo as most early French fighters. it also has two flexibly mounted guns that can attack from a wider range of positions relative to the target. this enables it to attack and exploit the Aviatik's blind spots fore and aft more easily. if you're careful, patient, and have a good plan of attack (and retreat) you can even take out multiple Aviatiks in one sortie. like any two-seater: you have to always remember where the machine guns are mounted and what their blind spots are. the Aviatik CI has a left-mounted machine gun station that covers roughly 7 o'clock to 10 o'clock and a right-mounted machine gun that covers directly forward to maybe 4 o'clock low. (maybe 5). in campaign missions I will frequently see enemy planes heading over the lines into French territory. they will usually be several thousand feet above me and heading the opposite way. I will typically try to climb away from them (towards the front lines) and plan on cutting them off from superior altitude when they turn back towards German lines. I might patrol and orbit for a while until I see them come back. I usually stay a few miles behind the front lines so that I can head straight for them when they try to go home. I want to attack them so that the only way they can escape me is by turning back and flying deeper into French territory. since the Aviatik and the Caudron have comparable speed I'm preparing the battle to be in my favor before I even come into contact with the enemy (again). plan your attacks based on a combination of known blind spots for the individual plane you wish to attack AND how it relates to every other aircraft in enemy formation. if they're flying in a 5 machine V-formation try to attack the trailing aircraft on the right-hand side first. if you try attacking the trailing aircraft on the left-hand side first (and do it from 7-to-8 o'clock of that position) you could have every plane in the flight open fire at you at the same time. so avoid that! between 6 and 5 o'clock low any version of the Aviatik is defenseless. fly directly below and behind the enemy (trailing right-hand plane) and let your observer open fire with the bow gun. I like to start my attacks about 300 yards behind and about 100 yards below. sometimes you can fly as close as 30 yards behind and 15 yards below... but I find that my observers will often not engage the enemy at extremely close ranges. if the enemy doesn't take evasive action you can pass safely underneath and the observer can shoot them up with the stern gun as well. this will frequently make them panic and break formation if the pilot is a rookie. the only members of the enemy flight that can get a clear shot at you are the second and third trailing planes on the left side of the formation. they'll have to shoot through, or past, their comrade in order to hit you. honestly, I consider balloons to be a more dangerous prospect than Aviatiks. because there ARE no blind spots when a balloon is being protected by waves of flak! Lots of great ideas here. It’s fun to fly one aircraft extensively, so you get to know it’s nuances. I’ll have to give the Caudron a try. Being a B/R man at heart, as well as having more than a passing interest in l'Aéronautique Militaire, I am a big fan of the Caudron. A beast to fly but I still thoroughly enjoy it. What a wonderful WOFF sight, a G4 lifting up into a sunlit sky above Belfort. Brings a tear to me eye it does.